BELTWAY, Liberty City, Sunday (NNN) — The new Wall Street Wars version of controversial video game Grand Theft Auto will let players deal sub-prime mortgages to earn in-game cash. 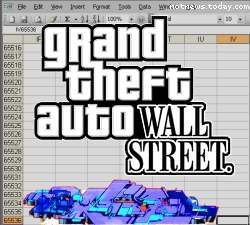 GTA: Wall Street is a significant advance in game technology, bringing the famous Red Ring Of Death to Microsoft Excel and thus giving PC gamers the advantages long enjoyed by Xbox 360 gamers. In the end game, being run as a Live Multiplayer Weekend from Friday through to tomorrow, the final “boss” is the US Treasury. Defeating this character depends on the player’s posse putting enough game points into play to crash the whole game if they are killed. Success earns the player and his team a 700 billion point bonus. Controversy surrounds a download available on the net called “Hot Latte,” which is said to unlock secret insider trading scenes. However, the final edition of the game is unlikely to feature explicit criminality, sticking only to the socially-sanctioned variety. Dan Houser, chief of game developer Rockstar, said: “Our games are intended as entertainment and relaxation for mature adults, not children. GARÇON! MORE COKE AND HOOKERS OVER HERE! CHOP CHOP, S’IL VOUS PLAÎT MATE! We are of course very happy to continue to work with all responsible bodies on these matters, as previously.” He then proceeded to snort an entire gram in one hit.